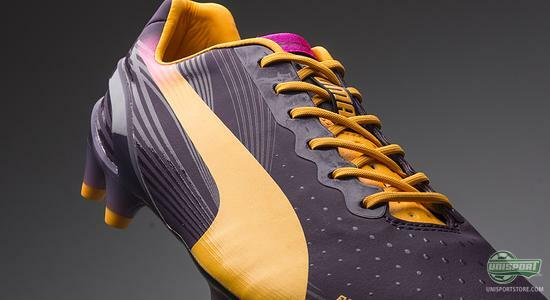 When the Champions League kicks off tonight we are going to see Sergio Agüero wearing a brand new and sharp colourway of the lightweight boot Puma evoSPEED 1.2, and we now take a closer look at Pumas brand new boot right here. It's sharp, quick and lethal in front of the goal. 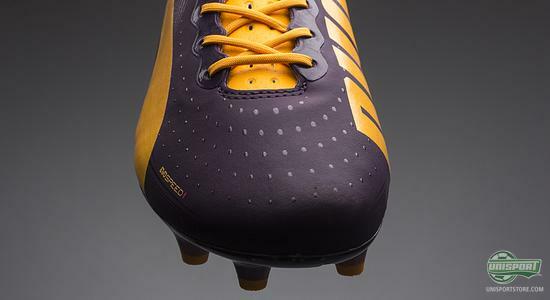 Puma's lightweight boot, the evoSPEED 1.2 has got all the qualities that a striker or any sharp offensive player is looking for, and now Puma are launching the speedy evoSPEED 1.2 in a new colourway that combines a dark purple with a subtle orange. The speedy beast and its new paint job will get an exciting introduction already tonight, when Sergio Agüero will wear his new boots as Manchester City clash with Victoria Plzen in the Champions League. 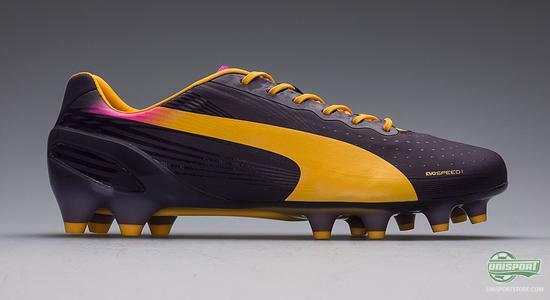 And if you should miss the new evoSPEED 1.2 tonight, then you will also see Oliver Giroud, Radamel Falcao, Gael Clichy and the latest member of the Puma squad Santi Cazorla wearing the boot in the nearest future. 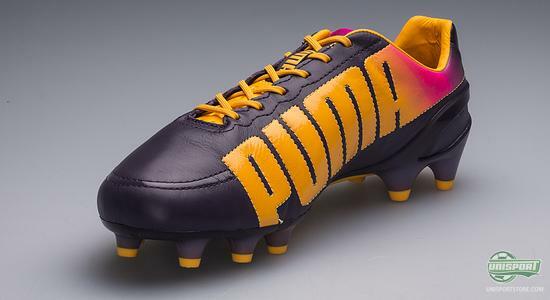 The Puma evoSPEED 1.2 is a boot that is aimed and designed to ensure a unique combination of speed, control and comfort. 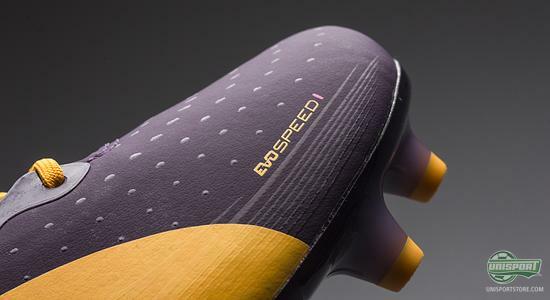 It is the second generation of the evoSPEED silo, which took over where the Velocity silo left off. And just as we have seen it with the black and white colourway, this purple and orange model will also be available both in a synthetic, as well as a leather version. 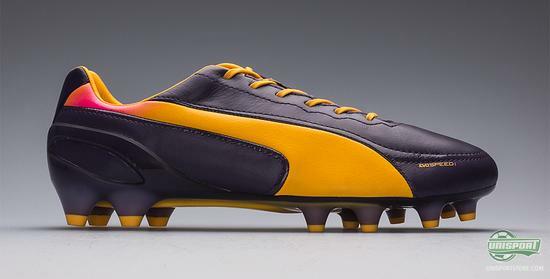 Hereby, Puma show that they are aware of that some footballers are super passionate about shaving off every possible gram from the boot, while others prefer natural leather and the comfort and other unique qualities that come along. 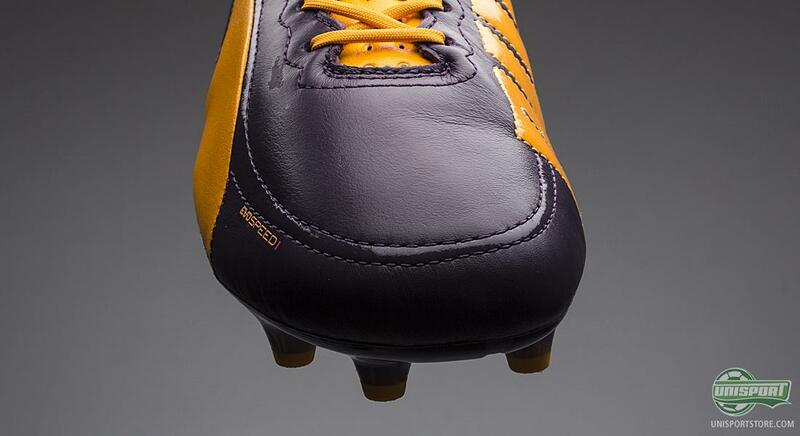 If we take a look at the synthetic version, this boot has been designed with three focus area; low weight, flexibility and fit. 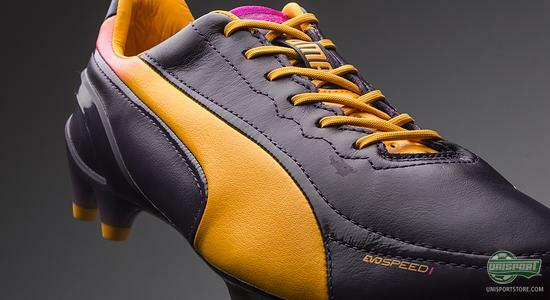 These three elements are combined in one of the lightest boots on the market  The Puma evoSPEED 1.2 weighs in at no more than 188 grams. In addition, it is equipped with a thin upper made of Japanese microfibre that helps to keep the weight at a minimum. This one-layer synthetic is made to wrap itself around your foot to provide a glove-like snug fit, as well as provide an incredibly sharp ball feel. The upper material has a leather-like finish, which especially speaks to those who may miss the leather, who are not ready to make the final shift. The upper is stabilised and supported by the evoSPEED 1.2 skeleton, named Everfit Cage by Puma. The thought is to have the technology wrap itself around your foot. It provides stability, especially around the midfoot, with the aim of adapting to the shape of the foot. The boot is built around Puma's amazing EvoAptoLast, which shapes itself to the natural curvature of the foot. You hereby get a fit that is almost tailored to your foot. Some people are not very into synthetic, and will prefer natural leather any day; which is the model we will look into now. The most important part of the leather boot is naturally the upper made nice and soft calf leather. It is quick to shape itself and adapt to your fit, hereby providing the personal, and incredibly comfortable fit, as well as the soft and natural touch on the ball, which leather is known to deliver. The boot is built from the same principles of: low weight, flexibility and fit, and Puma have done an impressive job in terms of creating a boot that is both speedy, and also has the special leather comfort, which a lot of top players are looking for in a boot. Weighing in at just 192 grams, there is no denying that Puma have nailed it. The very low weight both on the leather and the synthetic model is obtained, among other things, by the outsole made of PEBAX material. It is very thin, and hereby also very light. Yet it is still very durable, and most important, it is extremely flexible. It is further strengthened by the DuoFlex-zone beneath the forefoot, which provides a springy kick-off, as well as the brand new Speedtrack Spine located under the midfoot that adds to the stability. 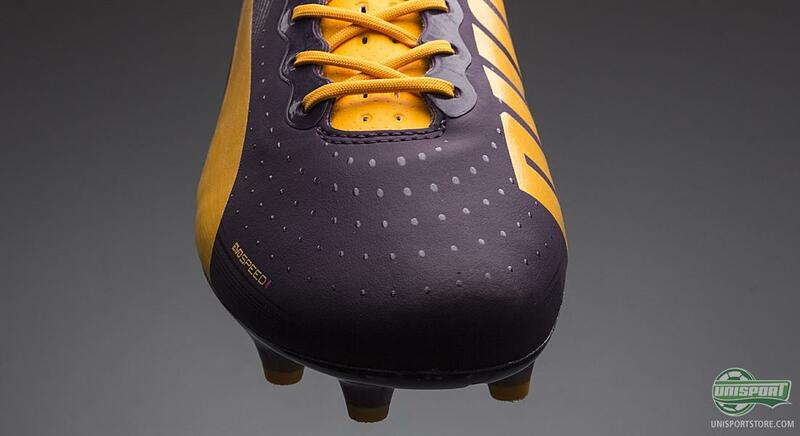 Looking at the stud configuration on the evoSPEED 1.2, we can see that Puma have left the raindrop shapes studs that we have previously seem on the evoSPEED and Velocity models. 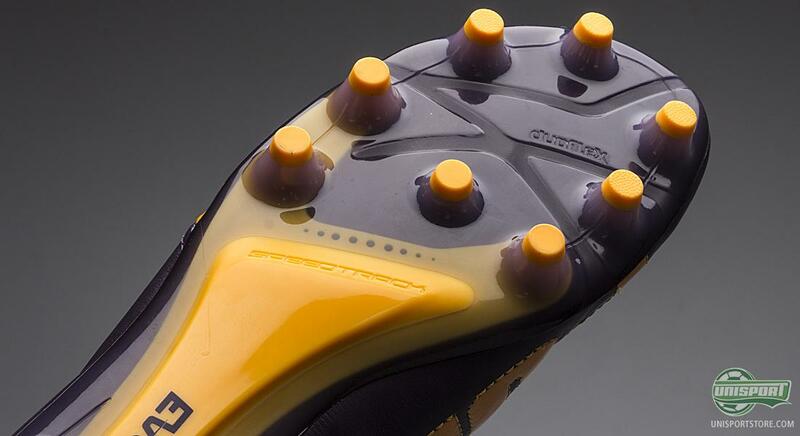 They have been replaced by classic rounded conical studs that provide a very stable platform and a good pitch grip. 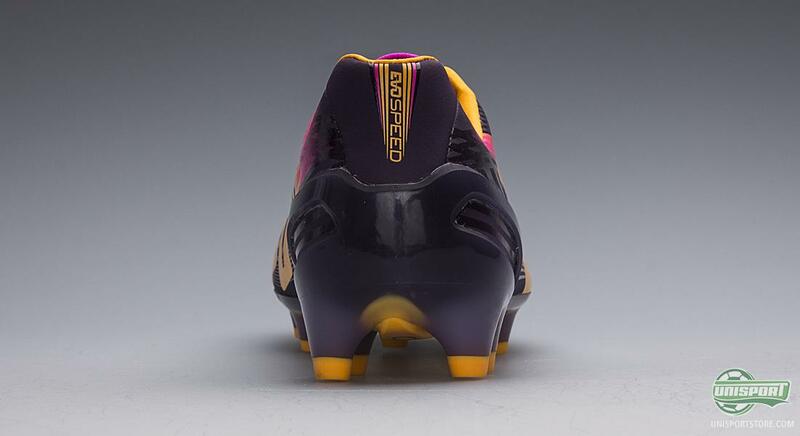 It will be interesting to see if Sergio Agüero will be able to make use of his speed and technique to give the brand new purple and orange colourway a big introduction. If he fails to do so, surely Cazorla, Giroud or Falcao will get the job done. 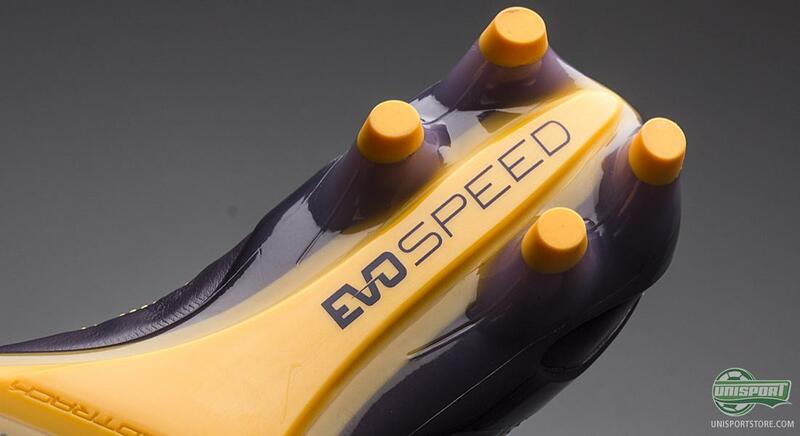 We will certainly not be surprised to see a lot of goals from the new evoSPEED 1.2. Puma have delivered the brand new evoSPEED 1.2 in a new and sharp colourway, which we will see on the feet of Sergio Agüero already tonight. What do you think of the new colourway? And which of three colourways, black, white or purple do you prefer? Feel free to leave a comment either here, or on Facebook and Twitter.